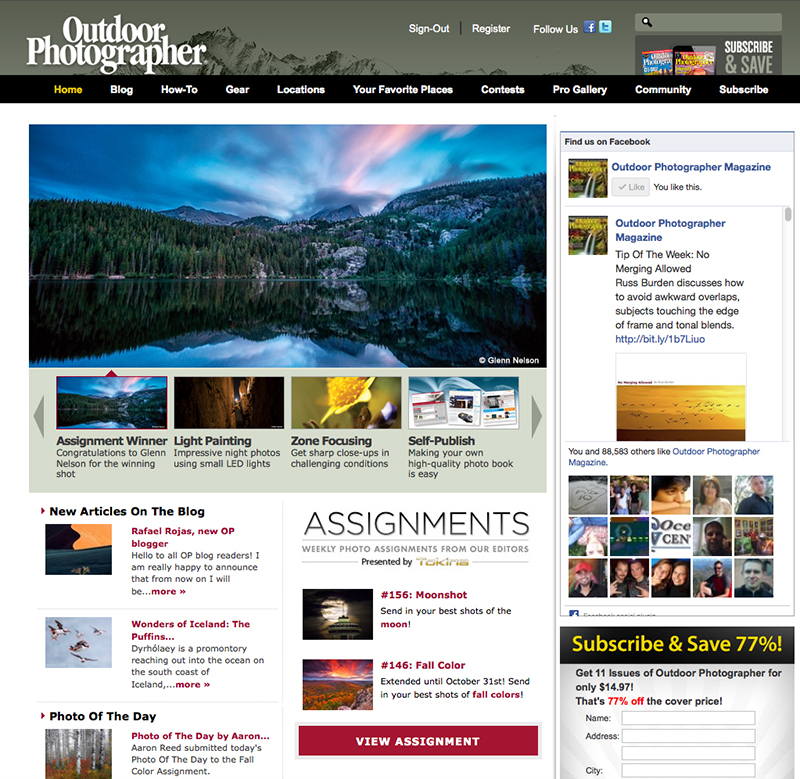 The image selected by Outdoor Photographer Magazine. Sometimes I wish I’d started taking photos — in earnest — 30 years ago so that now, in late mid-life, wouldn’t be my formative years as a photographer. Instead, all my training and education went into becoming a journalist and writer. Which allowed me to travel all over the country, and parts outside the country, to chronicle sports for nearly two decades. I suppose I wouldn’t trade that experience for anything. Still, I wish I’d also been at least a little more serious about making pictures. The upside is that everything still seems fresh and new, and I still get excited about reaching milestones. Like the latest: I got an email with the subject line: “Winner of the Outdoor Photographer Parks, Preserves & Monuments Assignment.” I immediately thought someone was pranking me. But it turned out to be from an assistant editor at Outdoor Photographer Magazine, informing me that I’d won an “Assignment,” which essentially is a challenge around a specific subject matter, in this case in honor of the shuttered national parks system. I’d already been looking through my work, to post on Facebook. I had two trips ruined because of the government shutdown. Revisiting my work from Rocky Mountain National Park, I happened across an image I overlooked during my numerous other edits. I don’t know why I did; I just did. That (the lead image on this post) is what I submitted. A few days later, I got another email for the assistant editor, saying the magazine wanted to publish the image full page … and pay me. In addition to almost completely overlooking the image is an apt backstory for it. Announcing my win on the magazine website. I was told that sunsets usually were not very eventful at Rocky Mountain National Park because the skies are always so clear. The morning and day of August 3, 2013, were cloudier than usual in the park, but the skies began to clear later in the afternoon. Not very optimistic, my wife and I took our time getting to Bear Lake. We first hiked to Alberta Falls, then were distracted by a Moose cow and her calf, some very engaging Golden Mantled Squirrels, and the most gigantic Elk I’ve ever seen. Later, we literally ran up to the trail encircling Bear Lake, with the sun diving quickly. I knew I wanted Hallett Peak in the background and searched frantically for some foreground subject matter. 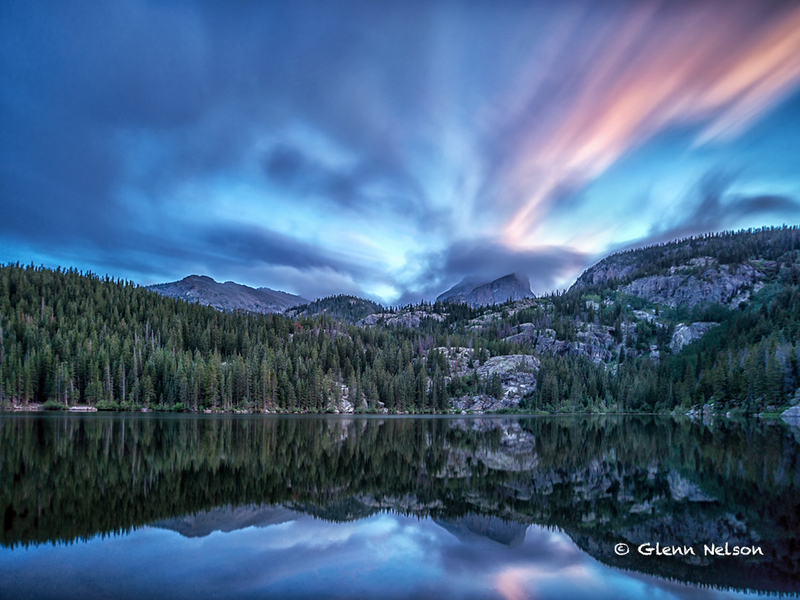 Finding none, I decided to rely on the reflection off the glassy smooth lake to draw eyes into the scene. Then I waited for the spectacular sunset that never came. This was to be my only sunset at RMNP so, seeing some clouds begin to roll in, I attached a 10-stop ND filter and went for a long exposure (nearly three minutes) in hopes of getting some decent color and cloud movement. I’ve had some of my images published in Parade and Slam Magazine, as well as several newspapers, but those were photos taken as part of my job, so it wasn’t that exciting. I also had a picture selected to be included in an exhibit at the Smithsonian Museum. I’ve long considered that, plus my website being named a finalist for an Online Journalism Award, to be my most exciting honors, more than any of my national writing awards. That’s because they were some validation of new directions I had taken, and new skills acquired, with my career. This picture is more personal. I only started taking photos outdoors after I took a class on photographing birds from the great Paul Bannick. My bird photography was derailed in June because knee surgery prevented me from carrying heavy gear in the field, so I decided to work on landscape photography while I healed. Next thing I knew, I at RMNP and was getting some great advice and instruction from Jared Gricoskie, who operates Yellow Wood Guiding, and later that night I was applying it all on my own. The most important words in the previous sentence reflect the source of my pride in this image: On my own. [ Smiles ] No argument. That is indeed a winning image!